The Selere are a race of aquatic elves which may be used for player characters. For additional information regarding this race, read their entry in the creature compendium. Presented here are guidelines for the play of Selere characters. The Selere are reclusive and prize their privacy. They prefer simple lives where honest effort is returned with consistent and fair reward. Selere elves are generally neither ambitious, nor forward looking, and prefer to let the future take care of itself in it's own time. Their days are spent working at the same inherited lifestyle as their parents and their evenings are occupied with leisurely games, the pursuit of pleasure, and idle conversation. Selere are content to let their rulers make most decisions for them and live easy lives filled with the plentiful bounty of the rich seas. Selere are idealists and socialists. They prefer to assume and hope for the best of all situations and they share their work and wealth with other members of their caste class. Like other elves, Selere possess a very long view of things and the passage of time, as such, is not very important to them or to their daily lives. Rather, the gradual and sure achievement of long term goals is more their pace of activity. Selere have no problem focusing on a particular short-term goal for several years or even decades. However, a Selere who feels that they have not found their place in society may work very hard and without tire to find their niche. Individual Selere have long green-blond or blue-brown to blue-black hair which is usually worn short. Longer hair styles are a general indication of wealth and rank in society. Their eyes are slightly larger than their land-bound cousins, are almond shaped, and often tinted brilliant and attractive rainbow hued colors. 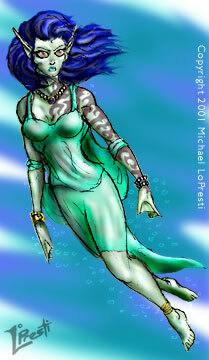 Like other humanoid dwellers of the oceans, the Selere have increased webbing between their fingers and toes. Their noses are broader, more sloped, and their ears are larger and more pointed than other elven races. Selere, like the Tenerthor, tend to adorn themselves with jewelry and tattoos. Because they must constantly swim through the water, the Selere are powerfully built. Even the feminine half of the race are typically substantially stronger than a fit, male-human laborer. The Selere are densely built and have a heavy bone structure and musculature. As such, the Selere are the heartiest and heaviest of the elfin races. Their height tends to fall between 4 to 5 feet tall. Roll 1d12+48 for the height in inches of male or female Selere elves. For weight, roll 5d12+150 for starting average weight of an adult Selere. Among elves, Selere are even longer lived then their cousins. Selere are considered adults when they have gained mastery in their first profession. Most Selere become masters of several professions over their lifetime, as their culture and community requires. This first mastery is typically acquired by the age of 200 years old. Selere may live to be nearly two thousand years old. Sometime after they reach a venerable age, the Selere elf departs from their community to seek the deepest parts of the sea. What happens after this is not known or is simply not spoken of by the Selere to outsiders. When rolling for starting age of a Selere player character, roll 4d12+60. When rolling max age roll 4d100+650. Selere are considered middle aged at 325 years, old aged at 417 years, and venerable at 650 years of age. The Selere prefer self-isolation from the surface races and even go so far as to exact extravagant tolls and sink the boats of surface dwellers who enter into their watery kingdoms. They are enemies of the Sahuagin and Kuo-toa, but are close friends with the undersea races of the Locathah, Merfolk, and Triton. Most non-seafarers are unaware of the existence of the Selere elves. Other elven races consider the Selere to be an unexplained race of unknown origin - many do not even consider them to be a kindred race. Sailors of the seas mistrust and fear the Selere for their reputation for raiding surface dweller merchant ships. As a society, the Selere are lawful, but individuals are typically neutral, willingly obeying the laws set by the higher classes. most display no inner desire to live a life as a benefactor, troublemaker, or extremist. They prefer to take the middle-road and live a life balanced by moderation and slowly made decisions. Selere dwell in large cities built to form concentric circles. Each progressively interior circle of a Selere city contains a successively higher class of inhabitants, the inner most realms of the city being the gardens and estates of the ruling and leisure class of Selere. These cities are deep under water, on the ocean floor, lit by sorcerous lights of rainbow hues and guarded by trained aquatic predators and warriors. Their homes are built from scavenged parts from ocean surface vessels, magically grown from coral, carved from great blocks of underwater stone, or built from the colossal shells of long dead giant sea creatures. Selere rarely worship gods, but Selere adventuring priests frequently choose to worship Chishleen, or other gods whose domains are related to the waters, culture, or the Deep. Illustree and Brakah are also common choices among Selere priests. Worshipers of Brakah pay homage to that god's influence over the dark (it gets really dark in the deep ocean). Selere are given a name suitable to their class. Generally speaking, the longer the name, the higher class they are a member of. As ruling and leisure class names can be quite long, members of those classes may abbreviate their names for use among their class. Most surface dwellers find Selere names difficult to pronounce and so many Selere adventurers take a second name from surface culture for the duration of their journeys through those lands. All Selere families also have a particular hand motion which is special to their home. This is how relatives know each other, even if separated by several generations and great distances. The names presented below assume the character originated from the laborer, artisan, or warrior social class. "Th", "Kuh", "Js" (zhua sound), "Ps", "Yc" or "Ic" (eyc sound, "Qz" (Qoz sound), "kp" (cup sound), "cq" (que sound, and "Ts" or "Tz" (tizss sound) are all common vocal gymnastics in the Selere language. Common male names are Psashen, Ycelian, Jsucai, Orsuasce, Jrezheli, Qzoqucshi, Kuojsalfa, Tzucleniya, Zhrathrosan, and Tsaculathah. Common female names are Psalhan, Ycalin, Jsucua, Koulla, Zhiali, Uskakli, Tzaraspsa, Qskuhsha, Thosazhasha, Tsakpthice, and Jsualcquali. Selere adventurers are typically the rare few of their kind who are genuinely curious about life above the ocean's surface. They depart from their aquatic lands to seek wealth and magical devices, to become knowledgeable of surface cultures, or to live as outsiders from their race. Most Selere find living above water to be uncomfortable and a temporary situation because of strangeness of breathing air without water and the itchiness of dry skin caused by prolonged time out of water. Adventurer Selere are assumed to have overcome these discomforts and problems, having adapted themselves to live either above or below water with equal ease. As companions, Selere often take a supporting role in the party. They make fine warriors, druids, bards, and sorcerers. Selere adventurers may come from any of the social classes of their society, but most frequently originate from the laborer, artisan, or warrior class. Selere adventurers often prefer to remain near to coastal regions or watery areas, but can be pursued away from these places with the promise of wealth and magic. Adventurer strongholds are usually built underwater in a lake or off the coast. +2 Strength, +2 Constitution, -2 Intelligence, -2 Wisdom: Selere are strong and sturdily built. This reflects the hardiness required to survive under the crushing pressure of the oceans and the strength necessary to swim everywhere one goes. Unfortunately, the Selere are not a race which embraces the advancement of learning or the exploration of the universe, nor do the Selere often perform beyond what is expected of them. Creativity and intuition are not encouraged in their young and a leisurely lifestyle makes them somewhat educationally apathetic. Medium-size: As Medium-sized creatures, Selere elves have no special bonuses or penalties due to their size. Selere base land speed is 30 feet. Darkvision: Since Selere dwell in the dark at the bottom of the ocean their physiology has adapted and granted them darkvision 60 ft.
+2 racial bonus to resist poisons. Selere, like much other sea-life, have a naturally strong resistance to toxins. Thick Skin: Selere have a naturally thick skin to help keep them warm in the cold depths of the ocean. This thicker skin also grants them a natural armor class of 12 and reduces all bludgeoning damage done to them by 1 point per die. This includes falls from great heights, but not crushing damage, such as being constricted by a snake or crushed between to closing walls. Water Breathing: All Selere possess an advanced respiratory system and can breath underwater as easily as they can breath the air above water. A Selere cannot drown in water, but may drown in other non-oxidized liquids and may suffocate from smoke or other conditions which prohibit the taking in of air. +5 racial bonus to Swim: All Selere are excellent swimmers and may opt to "take 10" even under stressful conditions. A Selere does not need to make a swimming check unless they are in stormy waters. Selere swim at a base speed of 20 feet. Swimming is a class skill for all Selere, regardless of their actual class. Selere may swim for a length of time equal to that which a human may walk, 8 hours, without a skill check. After this time they may continue swimming by following the rules regarding a forced march (PHB pg. 143). Favored Class: Fighter. A multiclass Selere's fighter class does not count when determining whether they suffer an XP penalty.